This morning on Facebook I wrote a post about carbohydrates or "carbs" as many people refer to them. I mentioned that Type 1 diabetics have to determine how many carbs are in the foods they consume before they take their insulin. How do you do that, you ask? Here's where I tell you. There are actually several different ways to determine how many carbs are in your food. 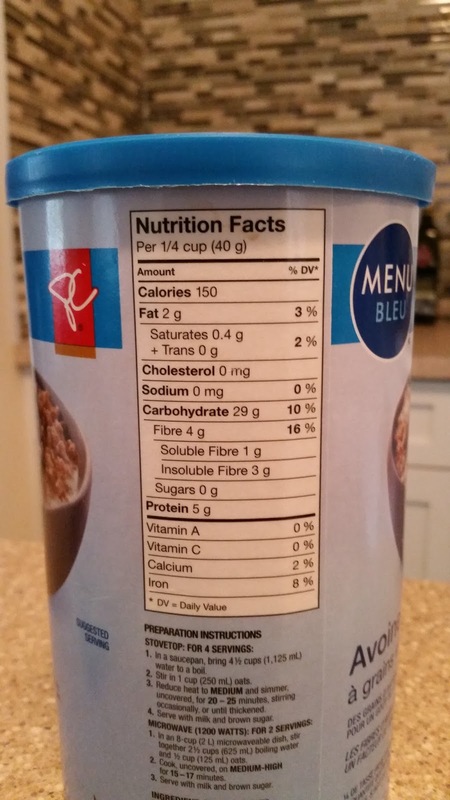 The Canadian Food Inspection Agency requires that most packaged foods put a nutritional breakdown on the label. According to this label, there are 29 grams of carbs in 1/4 cup of uncooked oatmeal. When cooked that works out to about a one cup serving which is a much larger serving than I would eat. I'd probably eat about a half cup (15 carbs), add cinnamon and walnuts (no carbs) and a couple of tbsp of apple sauce (6 carbs) and 1 carb for the almond milk. This gives me total of 22 carbs for breakfast. I recently read that the number on the box can be out by as much as 30%. Some days you just have to make the best of it. There's also a handy-dandy book you can purchase. 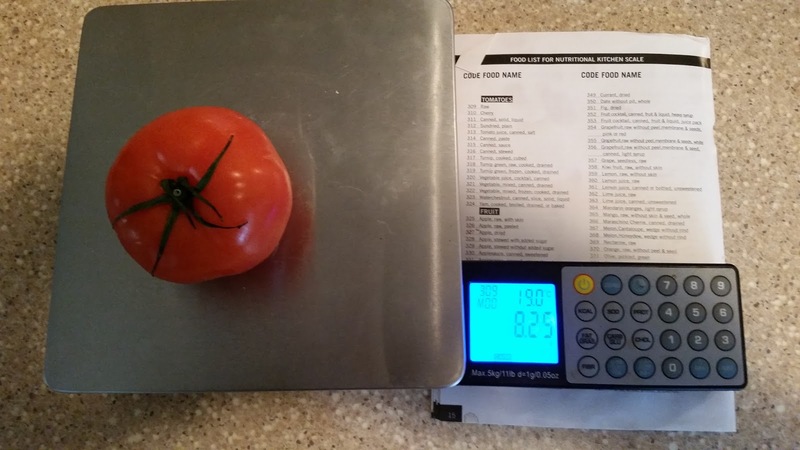 It's purse size - 11x15 cm and the listings are alphabetical, within the alphabetical listing of type of food. I find the list of beers and alcohol to be quite handy as well. 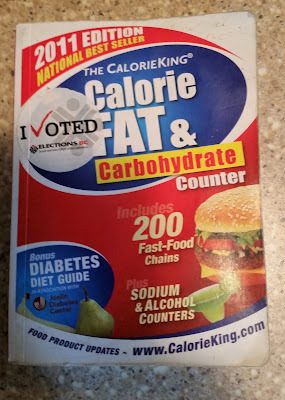 Spoiler, most hard liquor contains no carbs. There are also apps you can download, some for free, that have similar information and it's much easy to search an app than this bulky book. Calorie King Calorie Fat and Carbohydrate Counter also has listings of some common fast food restaurants and the carb counts of their meals. And speaking of restaurants many of the big chains have an online page where you can see the nutritional content of their offerings, including number of carbs, and some nutrition and health websites, like Livestrong have a page where you can search for chain restaurant meals as well. Sometimes I check things out before I leave the house and sometimes I check on my smart phone at the restaurant. Once in Boston Pizza I asked the waitress if she they had a copy of their menu's nutritional breakdown, which she brought to the table for me. As you can see the total carb count of Earl's Hunan Kug Pao chicken is 144 carbs. That's as much carbs as I normally consume in a day and a half. That meal would require me to take 12 units of insulin. My average dinner time meal is 50 carbs, requiring about 4 units of insulin. That's a lot of extra insulin to take all at once. 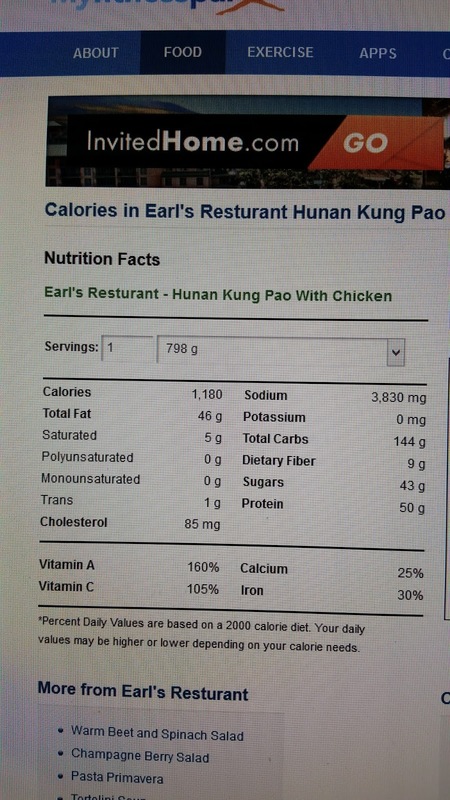 If I really wanted to eat the Kung Pao Chicken I would only eat half of it, and have the rest put in a doogie bag. What are the chances of me only eating half? Not good. A better idea is to ask the waitress if they could only give me half and box the other half ahead of time. An extra two units wouldn't be so bad, and it's not a big deal to treat yourself every so often. Or you can treat yourself every day. No judgement here. 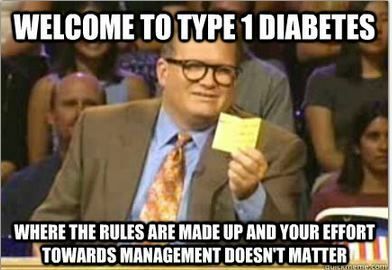 My dietitian (who is also a T1D) calls those treats "insulin worthy". For her it's Pumpkin Pie, for me it's Cheesecake. I never have a full piece though, because I've never sat down to figure out just how many carbs it would contain. I just don't want to know. I satisfy my craving with a bite or two of my hubby's dessert. The final method is my favourite: A nutritional scale. It feels more accurate, but unfortunately it's not very portable. They're relatively inexpensive (I think it was $25) and easy to come by. This is from the Stupor Store. Just turn the scale on, put the food on the scale, look up the number that corresponds with the food item, enter those numbers (in this case it was 309) press the carb/glucose button and the digital read out tells you how many carbs by weight - in this case 8.25. Once you add up all the numbers and figure out how many carbs are in your meal, there's a handy formula to calculate how many units of insulin to take based on the Carb Ratio you've figured out for yourself (it may vary depending on the time of day), your current blood glucose level and your ISF or Insulin Sensitvity Factor which you've figured out over trial and error over the years (and is subject to change without notice). If you use an insulin pump your Carb Ratio and ISF are programmed into the pump, so you just put in the number of carbs and it does the calcs for you. Did I mention I love my pump? I'll talk more about Carb Ratio and ISFs in a future post. Some days it really feels this way. As I've said before, a sense of humour helps.